On holiday in self catering accommodation, staying in hostels, on a campsite, or even visiting family or friends, have you ever felt the urge to bake a lovely fresh loaf of bread only to discover that a key piece of equipment – usually a set of scales, or a measuring jug – is missing? I may be a bit odd, but I’ve even been known to go out and buy the missing piece of kit just to get my loaf baked! Since then, I’ve given the question some thought, done a few experiments, and so today I’m going to share with you my ‘no weigh’, measurement free, (nearly!) foolproof loaf recipe that you can bake very nearly anywhere, with almost no kitchen equipment. Just a quick note first on difficulty – because this recipe depends, essentially, on judging the ‘feel’ of the dough to get the proportions right, complete novice bakers may struggle with this approach; but you don’t need to be an expert baker – if you’ve made a few loaves before, and have a sense of what a good dough should feel like, this technique will hopefully work well for you! Check how much flour is in your packet (standard packs of UK flour are usually 1.5kg but can be 1kg or even 3kg) and tip your best guess at 500g into your bowl or on to the work surface. Make a well in the centre, and add a heaped teaspoon of instant yeast (or a whole 7g sachet) and a teaspoon of salt. I tend to add the yeast to the well and the salt to the side. It’s useful if you have an approximate idea of the volume of your liquid container. (You’re likely to need about half a pint of water, or a little over.) Fill your glass or mug with lukewarm water and add it a little at a time to the well in your flour, mixing as you go. If you’re using a work surface rather than a bowl you are, I’m afraid, likely to make rather a mess, so do use a mixing bowl if you have access to one. Salad bowls or other serving bowls can make a good substitute. Keep adding water until all the flour is incorporated into your dough and the texture is a bit stickier than you really think it ought to be. The dough at this stage ought to be a bit tricky to work with and glue itself to everything. The reason for getting it to this stage is to make sure that the dough isn’t under-hydrated, as this is is the main cause of stodgy, disappointing loaves which don’t rise properly. Pour a generous glug of oil over your dough and work surface and start to knead the dough in the oil. Add more oil every if the dough gets sticky again. The process of kneading will mix the moisture evenly through your dough and you may well find the dough stops being excessively sticky just through the kneading process. But if you’ve been kneading for ten minutes or so and the dough is still too sticky, add an extra sprinkle of flour. Go gently with the flour, though, as I find it always needs less than it seems to get the texture of the dough nice and silky. Once you’re happy with your dough, and it’s well kneaded, form it into a ball, oil it well, and set it aside in an oiled bowl if you have one (or leave it on the worktop). Cover the dough loosely – a supermarket plastic bag is ideal, or use cling film if you have it, or a tea towel, or anything else that comes to hand! Set aside to rise until the dough at least doubles in size. Once the dough has doubled (which may take as little as an hour, but could take quite a bit longer in cold conditions – be patient and don’t rush this bit!) turn the dough out onto an oiled surface. Now, very gently, form it into a bloomer shape. I’m going to stress the ‘gently’ bit again, because it’s very tempting to get stuck in and almost re-knead the dough at this stage, and that’s not what you want to do at all. You’ll hear a lot of talk of ‘knocking back’ dough, but you’ll lose a lot of the air in the dough just in the shaping process. To form a bloomer (the shape you want for a bread tin is very similar), I fold both long ends towards the middle, then rotate the dough 90 degrees and do the same from the side. Then I turn the dough seam-side down and tuck the sides and ends under neatly. That’s it. No kneading, no bashing, just some gentle folding. You can form a round cob loaf by bringing the edges into the centre until you form make a general round, before turning the loaf over seam-down and tucking the bottom under neatly. Dust your baking sheet well with flour and place the bloomer in the centre of it. If you’re using a tin (or tin-substitute) I would oil or butter it first before dusting well with flour. Dust the top of your loaf with flour too, and put it back under loose cover somewhere warm for another hour or so. When the loaf is well risen, pre-heat your oven as hot as it will go. Take the cover off your loaf, and cut a straight slash down the centre with a sharp knife if you have one (or a more creative pattern, if you fancy!) and pop it straight into the centre of the oven. The loaf will probably take around 30 minutes to bake, but this will depend on the quirks of the oven, which you probably aren’t familiar with, so take a first look around 20 minutes and then keep your eye on things pretty closely. If you happen to have access to a wood fired pizza oven, you can even use this – just remember that these tend to run very hot so baking times will be quite a lot shorter! Turn the loaf once or twice to avoid any hot spots in the oven baking the loaf unevenly, or even burning it. The loaf is ready when the top is dark golden and crispy, and the base sounds hollow when tapped. If in doubt, put it back for 5 minutes – over-baking a loaf a a little is never a disaster – it just increases the thickness and crispiness of the crust – whereas an under-cooked stodgy middle is decidedly disappointing. If you have an oven rack to hand, set it to cool on this. There you go – a no-weigh, no-measure, home made, very tasty rustic white loaf, that you really can make almost anywhere you can get your hands on a few very basic ingredients & equipment. No excuse for rubbish bread this summer, then. Enjoy! What did I do with mine? Well, it was late lunch when it came out of the oven, so I sliced it, still warm (I know, but it’s irresistible, right?) 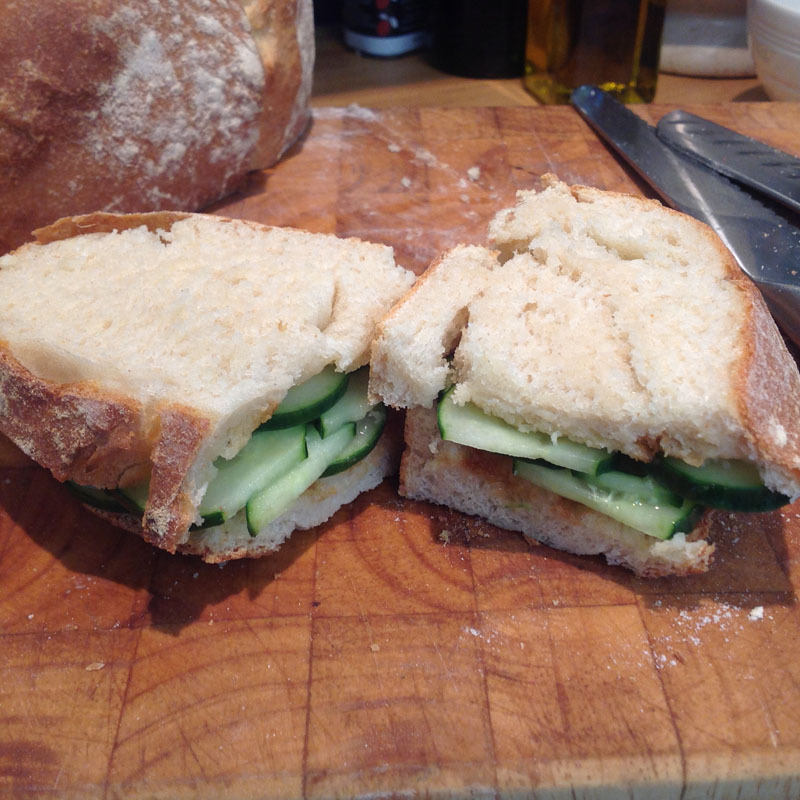 and made an old-fashionned but wonderful cucumber sandwich with one of our home-grown cucumbers, harvested yesterday evening from the polytunnel. A little taste of summer heaven! This entry was posted in Baking, Bread, How-to, Slow Food, Tested and tagged bread, country skills, family, food, home produce, recipe by Kate Watson. Bookmark the permalink. Excellent post – just what one needs when these things happen (I experienced that same lack of familiarity and equipment only in April while on holiday!). Hopefully this will help give some people a “push” to get into feeling their food, not just churning it out from recipes. Thanks for sharing!